Ludwig’s Rose Farm was established in March 1971. The farm is managed by a family team and currently employs more than 130 people. Ludwig Taschner, after whom the business is named, was born in Germany during the Second World War. He trained as a nurseryman and subsequently escaped from East Germany in 1960. He gained invaluable experience by working in nurseries in West Germany, Switzerland and England, where he already started specialising in rose growing. 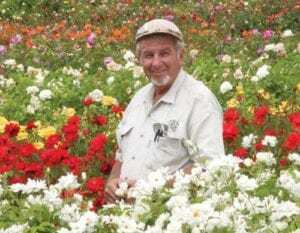 Ludwig arrived in Pretoria in 1962 and worked for Buss Nurseries until he founded Ludwig’s Roses north of Pretoria in March 1971. From small beginnings, the nursery has now become world renowned and the premier rose nursery in South Africa. We grow the largest selection of rose varieties available anywhere in the world. Ludwig’s has developed strong relationships with over 25 breeders from all over the world and annually tests thousands of new varieties according to their performance in the South African climate. From these, a selection of 10 to 20 new varieties are named and released annually. Ludwig’s Roses is proud to have released countless top garden roses since they first opened their doors to the public in 1971. Varieties like Just Joey, Burning Sky, Casanova, Esther Geldenhuys, Archbishop Tutu, Walter & Albertina Sisulu and South Africa are to name but a few of the “rose celebrities”. In 1978 Ludwig Taschner married Pamela Lange; they have three children, one son and two daughters. Left: Heike Taschner-Jeske with Dr Christian Jeske and their children Alexander & Xavier. Next to them are Bernd & Melanie Mewald. Then Ludwig & Pamela Taschner. Below are Anja Taschner with Gabriel Alhabal Taschner and Talhat Alhabal. His son, Halmar entered the nursery in 1999 and has become an integral part of the every day management. Heike, Ludwig’s eldest daughter, is part of the team and manages The Rose Kitchen restaurant and the Rose Shed. She translates her love for the rose with edible rose products. Anja, Ludwig’s youngest daughter is a learned horticulturist and enjoys the cross-pollination and creating of novel roses. She is responsible for Ludwig’s marketing, and spreading the love of the rose and all its benefits to the world. The two daughters develop all kinds of products from roses, such as the rose and rose hip jams, vinegar, syrups, rose body and home fragrance products like linen mist, oil diffusers and creams. Ludwigs and Pamela are rich in grandchildren and in addition to Alexander, the first grandchild, the family celebrated the birth of Heike’s 2nd son, Xavier and Anja’s and Talhat’s children – Gabriel and Sophia. Born to Halmar and Vanessa, little Ludwig Taschner the 2nd and Otto Liam were welcomed onto the rose farm. By sending out a free monthly “Talking Roses” e-mail newsletter to over 24 000 “rose friends”, Ludwig stays in close contact with each and everyone who enjoys the beauty of the rose. The website also has ample information on the growing of roses plus descriptions and photographs of all the different varieties and diseases. To subscribe click here. 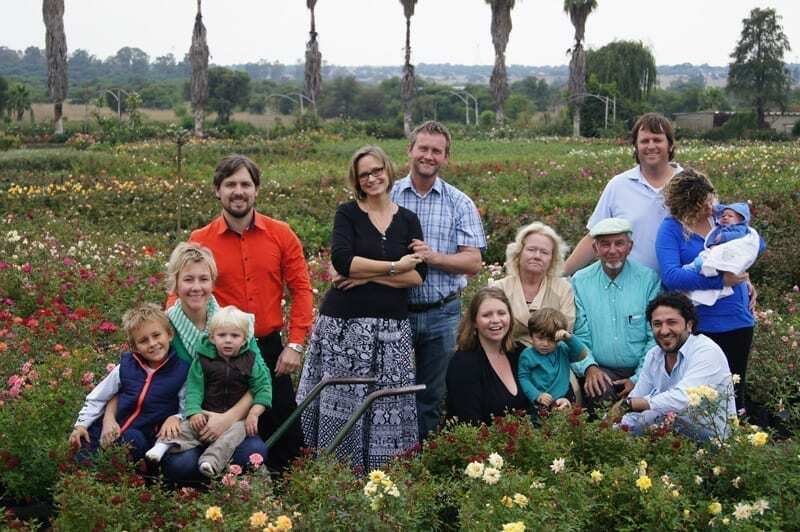 Visiting Ludwig’s Roses, the mother nursery north of Pretoria is a sight to behold. A million rose bushes in full bloom appear like an ocean of colour with an overwhelming fragrance. In 1996 Ludwig took over a 4.5ha cut rose farm, Ludwig’s Pretoria East. 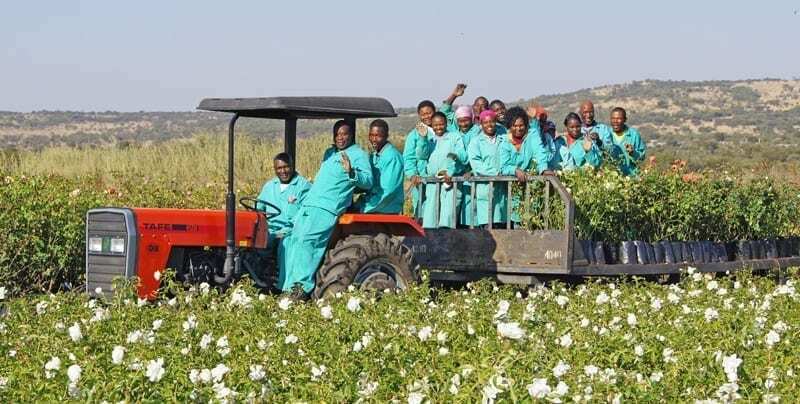 In 2004, Ludwig’s Roses Egoli was opened in Johannesburg, in 2006 Ludwig’s Roses Winelands near Stellenbosch, in 2008 Ludwig’s Star Roses in the Midlands, and 2014 Ludwig’s Roses Cape Town in Wynberg, opened its doors to the public. In 2016 a branch was built on the Outeniqua pass near George and in 2017 we will open the doors to the branch in Irene. These branches all boast hundreds of varieties to admire. Walking through the aisles of named roses is an experience in itself.